Getting started with a small business means a lot of sacrifices and a lot of the time means working from home to save on office costs. This can be a lonely way of working and full of distractions. We have a gift that can help freelancers and small business owners of Leyton get out of their ‘working from home’ slump and up into the heady heights of highly productive working. Especially for Christmas 2018, we’re now offering Flexy Desk Day Vouchers. Gift your loved one the use of our flexible Leyton workspace, designed to help them get inspired, get creative and get productive – from the interior design, to the cultural and wellness programmes, to the top–notch facilities. Available from This Time Next Year, 80 Ruckholt Road up until Friday 21st December and cost £10 per Flexy Desk Day. Each voucher is valid up until 30/06/12. For more information, drop us an email on hello@thistimenextyear.co.uk. There’s a nip in the air and glittery trees are going up all over Leyton… it must be nearly Christmas. You need a break and so do we. Here’s all you need to know about our opening hours over the festive period. The final Yoga class of 2018 will be Saturday 15th December, with classes resuming on Saturday 12th January. If you have any questions about access over Christmas, just drop us an email. With the rise in popularity in flexible coworking spaces, it was only a matter of time before a creative hot-spot such as Leyton had its very own. But rather than a franchisee of the larger coworking spaces you’ll find in the city, what Leyton has is its own independently run space which looks to further enrich an already thriving community. The very concept of this creative space is about seizing the opportunities to make an idea come to life, and encouraging people to come together to collaborate, learn and grow. It’s this ethos that has been appealing to the boroughs most creative residents and they are already feeling the benefits of using this innovative workspace, with one member sharing about the space on Instagram, ‘It’s high spec, high tech & creative. It includes bespoke furnishings, breakout spaces, swings and Perspex dome hammocks. Today is my 4th day here and my productivity has definitely increased. Now when I’m at work I just work. If I need a change of scenery I can go to another space and carry on working. And when I get home, I am fully present with the family after having a productive day. I don’t feel guilty and I’m not thinking about the work that needs doing upstairs. It’s been a win win for me.’. On its surface Leyton’s new workspace is flexible, airy and filled with natural light. 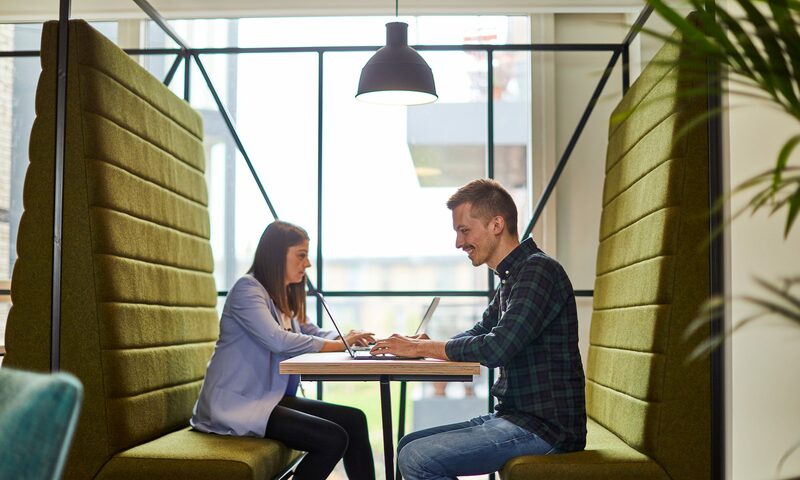 The interior is designed to help you get inspired, get creative and get productive, and the facilities on offer have been well thought out to make your working day flow seamlessly; including breakout spaces, meeting rooms and phone booths to keep private conversations private. This Time Next Year believes that for a business to truly thrive, you need more than just a great space. You need to be around great people too. Since its opening in May, This Time Next Year has played host to a plethora of interesting and enriching events. Regular yoga and mindfulness classes look after the minds and bodies of members, while one-off events are member-ledgiving the community space to share their passions and projects. Previous events being She Says London and Stories On Our Plates: Recipes and Conversations, and Author Elaine Kasket is set to deliver an debutant book talk for her upcoming publication, All the Ghosts in the Machine. The events space has also served a great purpose for the Leyton community to find out more about Waltham Forests’ London Borough of Culture activities, with funding surgeries and launch events. Behind the scenes, the team continues to work to develop the space’s wellness programme to encourage its members to enjoy a better work/life balance. Visit us online at www.thistimenextyear.co.uk to find out more about the community of member, upcoming events and the spaces on offer. Get in the Midler some Hocus Pocus facts. It’s fun and camp, with a trio of wicked witted witches, so it’s no wonder Hocus Pocus has made a fierce comeback for its Silver Halloween Anniversary. To celebrate of 25 years of the Sanderson sisters on screen we look at some of the fun facts from the film. The role of Max Dennison was originally offered to Leonardo DiCaprio. He turned it down to appear in What’s Eating Gilbert Grape which was also released 1993 and earned him his first Oscar nomination. Omri Katz, who eventually took the part of Max, was unwell at the time of his first audition and was initially rejected for the part. The Sanderson sisters could have been very different too as the role of Mary Sanderson was originally offered to Rosie O’Donnell and Jennifer Lopez auditioned for the role of Sarah Sanderson. During a February 10, 2008 interview on the BBC show ‘Breakfast’, Bette Midler stated that this was her favourite of all of her films. Her other favourite film role, according to her autobiography was voicing the poodle Georgette in Oliver & Company. If, like us, you follow Bette Midler on Instagram; you’ll have seen this affect first hand as she has been sharing pictures of the Sanderson sisters throughout October. Sarah Jessica Parker has also shared her love for the film saying that she enjoyed being in the flying harness so much that she would stash a copy of the New York Times on her person and read in the air between takes. When Bette Midler takes the stage at the town Halloween Party, she says “Hello Salem, my name is Winifred. What’s yours?”. This is a take-off of the famous line, “Hello world, my name is Rose, what’s yours?” spoken by Mama Rose in the musical “Gypsy”. Midler played Mama Rose in the television version of Gypsy the same year this film was released. At the end of the film, Billy Butcherson pries open his mouth and coughs out dust and moths. Doug Jones who played Bill revealed the moths that come out of his mouth in the scene are real. Sarah Jessica Parker also gets a mouthful of creepy crawlies as when Sarah Sanderson puts a spider in her mouth to seemingly eat it. Parker recently revealed that she actually ate the spider. Several scenes appear in the original trailer that are not included in any theatrical, VHS, or DVD version of the film. They include the kids attempting to push the witches into a pool, the witches being surrounded by trick-or-treaters holding out their hands, and Mary snacking in a grocery store only to be dragged out by Winifred. Disney bought the script way back in 1984, then sat on the project for eight years. The original title was ‘Disney’s Halloween House’ and was intended to be much darker and scarier. Rumours that Disney considered turning it into a made-for-TV movie at one point have spread over the Internet but have not been confirmed by the cast and crew. The film was released in America in July of 1993, this was so it wouldn’t compete with The Nightmare Before Christmas, Disney’s other Halloween release that year. However, for us in the UK we had a release date of 29th October which made a lot more seasonal sense. It has became increasingly more popular over the years, now appearing on television regularly during the month of October. We screen this Halloween classic here for free on Wednesday 31st October at 6.30pm. Email hello@thistimenextyear.co.uk to book your free place. In 2019, Waltham Forest will be the first ever London Borough of Culture. The award from the Mayor of London will ensure arts and culture is placed at the heart of our communities. The year will explore the themes ‘Radicals’, ‘Makers’ and ‘Fellowship’ in a collaboration between local residents, artists and creatives creating a once in a life time celebration of the place we call ‘home’. Waltham Forest, London Borough of Culture 2019 will shine a light on the character, diversity and cultures of the borough, the things we have in common and the things that make us different, a year-long celebration of the real cultures of London by the people who live here. The exciting initiative for artists announced is open to creatives across all disciplines – from the visual arts to theatre, dance to poetry – and will offer people the chance to work with Waltham Forest’s local communities, helping shape the first ever London Borough of Culture. Each project will explore how culture informs identity in one of seven wards of Waltham Forest. One opportunity partners with Waltham Forest’s award-winning William Morris Gallery to offer a visual artist the opportunity to be Artist in Residence, exploring new responses to William Morris’s legacy and to the gallery. The remaining six opportunities will be open to artists of any discipline. Three will be offered to artists based in East London and three to those based anywhere worldwide. Successful proposals will work with our residents to co-create projects over the course of six weeks to three months, and receive an artist fee, project budget and full support from the London Borough of Culture’s creative and marketing teams. Sam Hunt, Creative Director of London Borough of Culture 2019, said: “We are excited to be launching this open call for artists to help define the first London Borough of Culture. We have not restricted this open call to art form but are really interested in working with individuals and groups who share our ethos of ensuring everything we do is in some way co-created with the communities of the borough. Cllr Clare Coghill, Leader of Waltham Forest Council, said: “This is an incredible opportunity to tell the stories of Waltham Forest. If you have a bold, ambitious, imaginative idea for the London Borough of Culture programme, we want to hear from you. The artist projects are one of many initiatives London Borough of Culture 2019 is offering to enable organisations and individuals to tell Waltham Forest’s stories. Earlier this month, Waltham Forest opened the Fellowship Funding scheme, offering £500,000 to ensure London Borough of Culture 2019’s lasting legacy, and help the next generation of local talent find their feet and make their mark. Calling all Artists: TTNY Wall Art Competition!